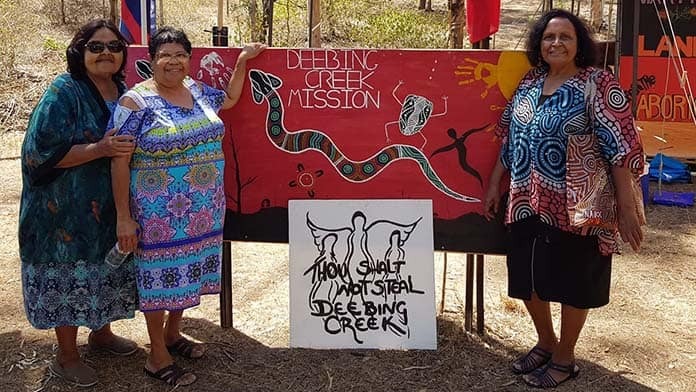 In late January, Yuggera Ugarapul people and supporters began occupying the site of the old Deebing Creek Aboriginal mission in Ipswich, outside of Brisbane. They are protesting against a proposed 925-lot housing estate planned by Frasers developers. This development has long been contested by the Yuggera Ugarapul, who are recognised native title applicants, along with many other Aboriginal and community groups. There are important sites and unmarked graves right across the proposed development area. The campaign is demanding the State Government buy back the land and return it to Aboriginal ownership. Through February, the campaign had reached out to trade unions for support. One attempt to bring bulldozers to start work was stopped by the CFMMEU after a few hours, while a court injunction appealing to heritage laws bought some more time. Then on 6 March, Frasers mobilised scores of police to evict the small group of traditional owners watching the camp. Karen Coghill was arrested and charged. But a swift mobilisation by the CFMMEU brought 50 unionists to the site. Soon, large numbers of Aboriginal people and many other supporters swelled the crowd. “When I was thrown off the camp it was devastating. My sistergirl Karen got arrested. Then I looked down from our little hill and there were all of these unionists standing up to the police. “In a minute they all showed up, ready to fight and rumble for what is sacred to us. They kept my spirit going, it was unreal. “And then our people started coming in big numbers, it made it even more special”. The developers backed down and allowed the protestors to re-establish their camp for the struggle ahead. This campaign shows the power of mobilising organised workers behind fights for Aboriginal rights. At the centre of the action on 6 March was young Bundjalung carpenter and proud CFMMEU member Jesse Leach. Jesse was at the camp when the police arrived and climbed straight up a tree. I’m an apprentice carpenter. I started with a training company, but they were rorting me. They were getting $45 an hour for having me on, but I was only being paid $11.50. I wanted to leave. But the union delegate kept me involved, I left the training company for a job on a big union site. I’m Bundjalung from NSW. I’ve learnt so much more about my culture through the union. I’ve met Elders, I’ve been involved in campaigns for First Nation rights. I went to a union conference with other Indigenous construction workers in Cairns. I made a speech to the press there and said I believe that we are on sovereign country. Before we start digging into anyone’s land, we need to know whose land it is. We need to hear from the Elders. Since then we make sure in EBA agreements there needs to be a welcome to country before work starts. And we need to take a stand like at Deebing Creek if the Elders are not happy with development. How did you get involved with Deebing Creek? One of my union delegates sent me a big article about it just a week before my arrest. He contacted me about coming out to the camp on a Saturday afternoon. I took a BBQ out there. We set up tents, brought torches for the camp. Then on Wednesday, the union picked me up from work and took me back to the camp to help set up a fence. When the police arrived, I was half way through building the fence. We had been expected a school group to visit the camp at that time. I went straight up a tree, I was really drawn to it. Once I was up there, the Aunties were giving me background information on the tree, that it’s a scar tree. The CFMMEU stands hard for Deebing Creek and the First Nations people. That day, every site in Brisbane basically where there was a CFMMEU flag running, there was at least one delegate from there who jumped straight in their cars and came straight out. They all came for the same reason I went up in the tree. Look at the bigger picture—it always was and always will be Aboriginal land. You can’t just come over and bully the First Nations people. The union can’t stand seeing someone being stood over, we will be there to help out.